(2014). Preparation of Sodium Dodecyl Sulfate Modified Pyrrolidine-1-dithiocarboxylic acid Ammonium Coated Magnetite Nanoparticles for Magnetic Solid Phase Extraction of Pb(II) from Water Samples. International Journal of Bio-Inorganic Hybrid Nanomaterials, 3(3), 143-156.
. "Preparation of Sodium Dodecyl Sulfate Modified Pyrrolidine-1-dithiocarboxylic acid Ammonium Coated Magnetite Nanoparticles for Magnetic Solid Phase Extraction of Pb(II) from Water Samples". International Journal of Bio-Inorganic Hybrid Nanomaterials, 3, 3, 2014, 143-156. (2014). 'Preparation of Sodium Dodecyl Sulfate Modified Pyrrolidine-1-dithiocarboxylic acid Ammonium Coated Magnetite Nanoparticles for Magnetic Solid Phase Extraction of Pb(II) from Water Samples', International Journal of Bio-Inorganic Hybrid Nanomaterials, 3(3), pp. 143-156. Preparation of Sodium Dodecyl Sulfate Modified Pyrrolidine-1-dithiocarboxylic acid Ammonium Coated Magnetite Nanoparticles for Magnetic Solid Phase Extraction of Pb(II) from Water Samples. 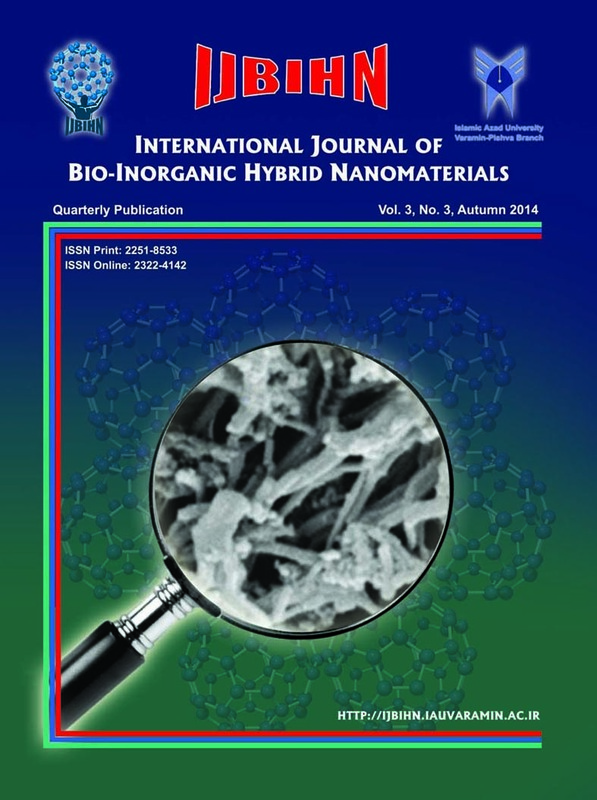 International Journal of Bio-Inorganic Hybrid Nanomaterials, 2014; 3(3): 143-156. This paper describes the development of a procedure for Pb(II) ions removal from various water samples after magnetic solid phase extraction (MNPs) by magnetite nanoparticles (Fe3O4 NPs) modified with sodium dodecyl sulfate (SDS) and pyrrolidine-1-dithiocarboxylic acid ammonium (PDTCAA). The synthesis of Fe3O4 NPs was certified by characterization techniques including field emission scanning electron microscopy (FESEM), X-ray diffraction (XRD), Fourier transforms infrared (FTIR) spectroscopy and vibrating-sample magnetometer (VSM) and the determination process carried out by flame atomic absorption spectrometry (FAAS). Influential parameters affecting the extraction efficiency such as pH, mass of adsorbent, and amounts of modifying agents along with desorption conditions including type, concentration and least amount of the eluent were investigated and optimized. Under the optimized experimental conditions, a dynamic linear range (DLR) of 2.5-50 μg L-1 was obtained and the limit of detection (LOD, n = 6) and relative standard deviation (RSD %, n = 3, C = 10 μg L-1) were found to be 2.5 μg L-1 and 2.2%, respectively. The developed method was applied for removal of Pb(II) ions from water samples.